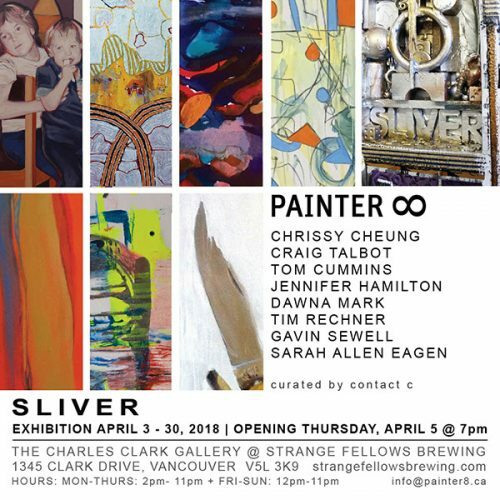 Sliver is a group exhibition by the Canadian artist society, PAINTER8. Each artwork makes up a “sliver” of the whole exhibition. Whether abstract, figurative or conceptual, members of PAINTER8 aim to establish dialogue and challenge each other as artists both in theory and in form. The visual artists exhibiting will be Chrissy Cheung (Vancouver), Craig Talbot (Cardston, AB), Tom Cummins (Vancouver-Auckland), Gavin Sewell (Montréal-NYC), Dawna Mark (Calgary), Jennifer Hamilton (Montréal-Laurentides), Tim Rechner (Edmonton), Sarah Allen Eagen (Toronto-NYC). PAINTER8’s mandate is to create dialogue with other artists through shared visual language, and to advance art creation across Canada by bringing together artists with unique backgrounds.